A Tempest stormed on the third floor of the Shatner building these last weeks! Every year the Mcgill Players’ Theatre showcases student thespians in various plays. The most recent one was The Tempest by William Shakespeare. When I chanced on the modest poster advertising the representations, I jumped on the opportunity. The Players’ Theatre is a ‘cozy’ but never crowded venue that is worth it. Discovering The Tempest there was enjoyable and the acting was “really good for students” noted… the single international student I convinced to attend. The representations are over, but be on the lookout for their next productions. It is cheap (6$), close by and easy to get first row seats. The second hidden gem is the Salon du Livre de Montréal (pictured above). This one might be more intimidating as it is a sprawling book fair solely in French – ok, maybe there is a smattering of English books. It occurs every year in November at Place Bonaventure (800 Gauchetière Ouest). It took place last week but look for it every year. 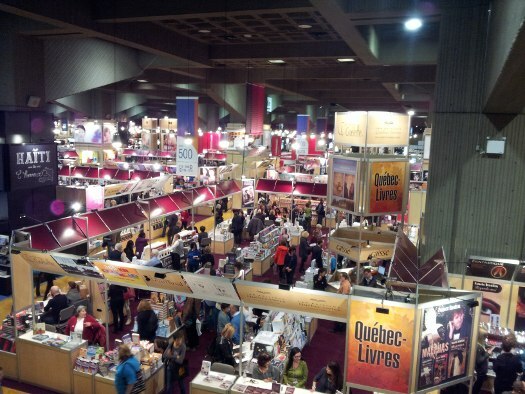 This vast fair is especially representative of the Montreal reading and book culture. It welcomes famous authors like Kathy Reichs, Patrick Sénécal, Marie Roberge and countless others. See, there is even some (at least one!) English speaking authors! It is even more fun if you can go with someone familiar with it or so I’ve been told… by the only international student I managed to convince to come. It is a great excuse to perfect your French and write up the list of books you want for Christmas. I am not the only one to keep such a list, right? Pro tip: go on a Friday night; it is typically open longer and there is much less people than on the week-end when it is very crowded. The last gem is much less hidden, but we sometimes forget about it: the Montreal Museum of Fine Arts. It is open year long, but it usually puts on display a new temporary exhibition just in time for the holidays. As an undergraduate student, it was my go-to activity after my last final. The calm and beauty of the paintings is quite soothing. This year they have Renaissance paintings and illustrations by artists of La Pastèque, a home-grown delicious comics publishing house. Who knows, maybe this year I will be able to convince…one international student to come! I love the Musée des beaux arts! Especially the permanent exhibit that is free free free! Hey Guillaume! Thank you for sharing these artistic overlooked spots in the city. I’m always looking for something new and artsy to do but I usually end up going to the local bookstore because I’d have exhausted everywhere else! I look forward to more posts like these and the more pictures and personal experiences, the better the marketing. I’ll be sure to check out the Salon du Livre next year. It’s too bad I didn’t hear about it before. Next Post So, what is it you do all day?